("Vase seized by ICE from Getty Museum returned to Italy", States News Service, November 10, 2005; see also the Getty press release October 3, 2005). The piece, made in the region of Paestum in southern Italy, was handed over to the Italian authorities and flown back to Rome. It was reported that the krater had been discovered in the 1970s; the finder exchanged it, reportedly, for a pig. By 1978 the pot was in a "private collection" in Switzerland where it was seen by a curator from the Getty. 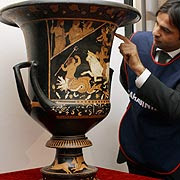 The krater was then placed on loan to the Getty and purchased three years later from Gianfranco Becchina for US $275,000. The first official request for the krater's return was made in 1999. Among the other returns from the Getty to Italy was an Attic red-figured amphora showing Herakles and Apollo struggling for the tripod (formerly inv. 79.AE.139). It was purchased in 1979 from Palladion Antike Kunst, Basel. This gallery was run by Becchina's wife, Ursula Juraschek, also known as "Rosie". These three pieces are discussed in detail by Gill and Chippindale. In more than four hours on the stand, Giuseppe Putrino, an officer with the art theft squad of the Italian military police, or carabinieri, expounded on documents, including faxes, invoices, money transfers, letters and Polaroid photographs, confiscated during police raids on Mr. Becchina's warehouses in Basel and his home in Castelvetrano, Sicily. There are likely to be more revelations.